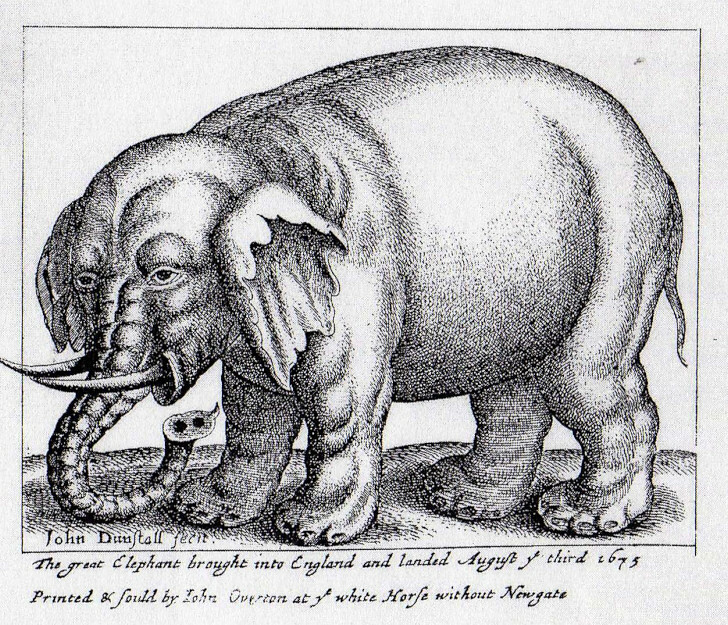 Elephants have had a strange history in Britain. For many centuries there were no elephants in the country, and yet they lived in the popular imagination as fabulous, powerful animals. They were like dragons and basilisks, half-real, half-fictional. Few people could be sure that they definitely existed, let alone be confident of knowing what it might be like to meet a real elephant. In the absence of hard facts imagination takes wing, and falsehoods about elephants abounded. In the medieval period and later it was widely believed that elephants lived for two or three hundred years, that they were frightened of mice, that they worshipped the moon, that they could read Greek. The monks whose gorgeous illustrations fill the medieval bestiaries had never seen elephants, and so they copied illustrations in earlier bestiaries, which were themselves copied from earlier works - in the process, mistakes were multiplied and magnified. The bestiary elephants are typically ludicrous creatures equipped with boarish tusks, trumpet trunks and slender, deer-like legs. 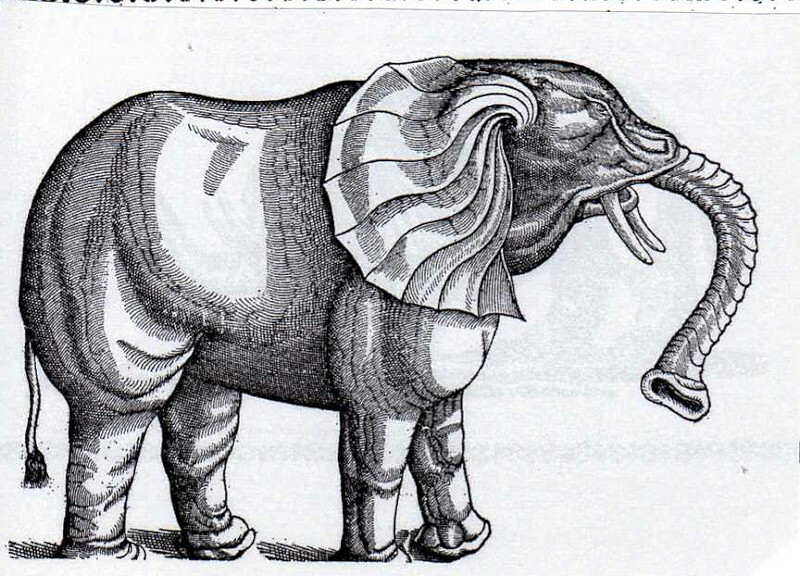 Very occasionally, a real elephant appeared to challenge these inventions. 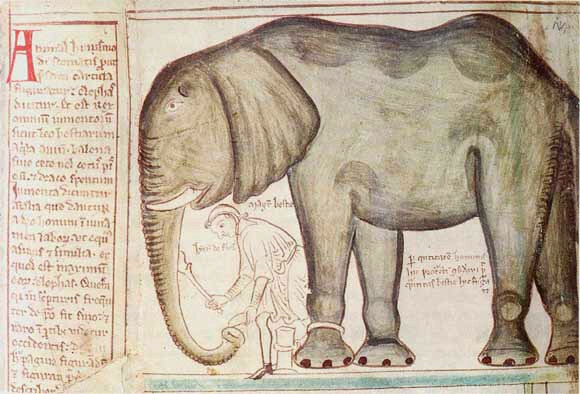 The Romans supposedly brought elephants to Britain in the invasion of A.D. 43, and in the winter of 1254 Louis IX of France gave Henry III of England an African elephant. Housed in the Tower of London, it was given fine wine and fed choice cuts of beef, a diet which may have contributed to its early death. It's possible that there was another elephant in England a few years later: an elephant's leg-bone, found in Chester, has been carbon-dated to the 14th century. These real animals were soon forgotten. What survived, in people's imaginations, was a variety of fictional elephants: some huge and terrifying, with sharp tusks and gramophone ears, others squat and tubby. It was in the mid to late 18th century, the period in which 'The Elephant Keeper' is set, that the imaginary life of elephants began to fade. Travel to Africa and India had become more common; zoology was increasingly well organised, and from the 1790s there was a London menagerie in which members of the public could see elephants. Misconceptions about the habits and nature of elephants persisted for many years longer; but it was no longer possible to think of elephants as not real. By the mid nineteenth century, even people living in deep in the countryside must have had a fair idea what a real elephant looked like. 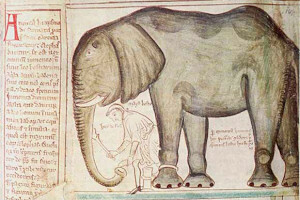 King Henry III's elephant and its keeper, drawn by Matthew Paris, 1255. The keeper, bending by the trunk, is named as Henricus of Florence. 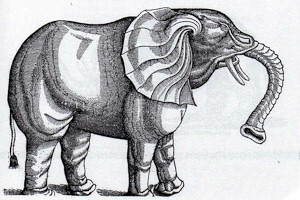 Paris' depiction of the animal reflects the widely held notion that elephants had no knee joints, and were therefore unable to get up if they fell over. 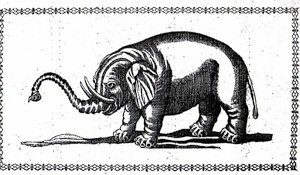 Mid 16th century woodcut of an elephant, in Conrad Gessner's 'Historiae animalium'. The woodcut was widely reproduced, reaching English readers in the early 17th century with the publication of 'The Historie of Foure-Footed Beasts' by Edmund Topsell. 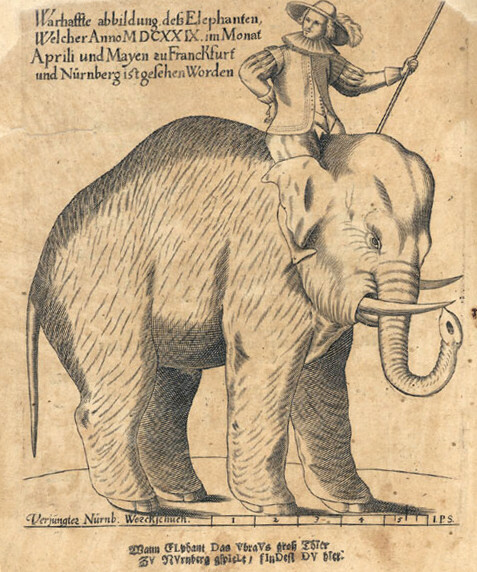 An elephant landed in Amsterdam in 1629, drawn by Caspar Horn. For added effect Horn decided to sharpen the elephant's tusks. The text tells us that the elephant was exhibited in Frankfurt and Nuremburg and seen by thousands of people. 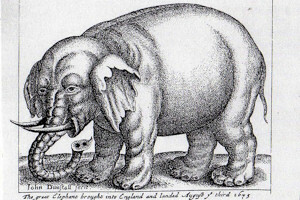 Engraving of an elephant landed in England on 3rd August 1675, by John Dunstall. 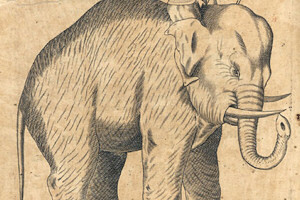 Possibly the first elephant to reach England since the 13th century, but did Dunstall actually see the elephant? If so, it would seem that he ignored the evidence of his eyes, or perhaps the truth is that he depicted the fictional elephant that he thought his public wanted to see. The segmented trunk is lifted from Gessner, and the inspiration behind the whole piece is probably the famous woodcut of a rhinoceros made by the German artist Albrecht Durer in 1515. 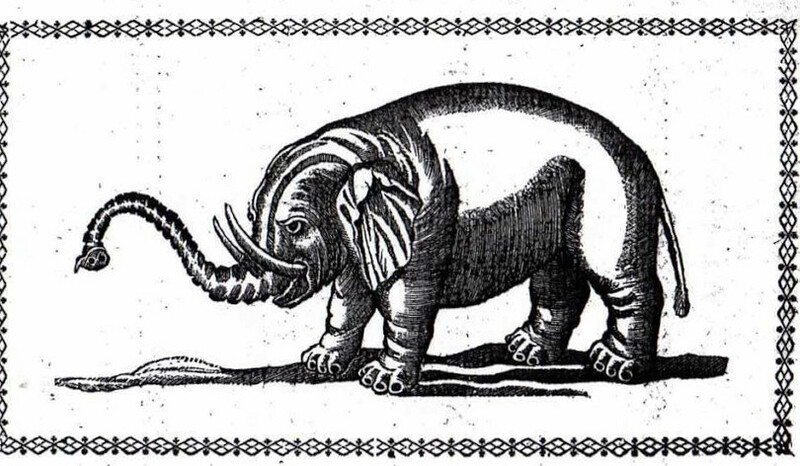 Woodcut of an elephant from Thomas Tennant's 'The Natural History of the Elephant', London 1771. 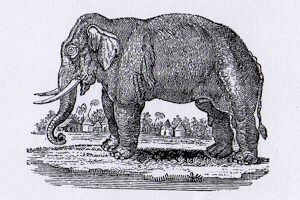 Engraving of an elephant by Thomas Bewick, in his best-selling 1791 work 'A General History of Quadrupeds'. 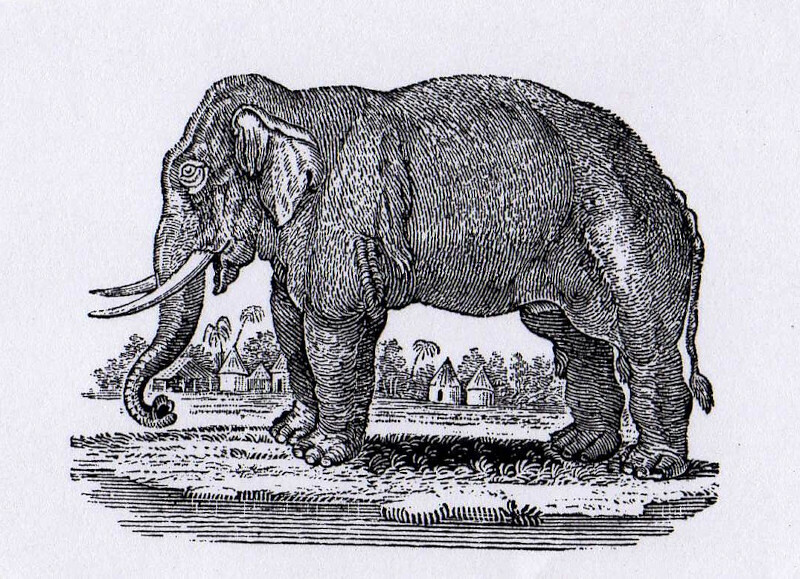 Since Bewick hadn't seen an elephant, he copied the picture in the great 'Histoire Naturelle' by the French biologist Buffon. In order to make the elephant look more attractive and to emphasise its human characteristics, he gave it large and unelephant-like eyes.